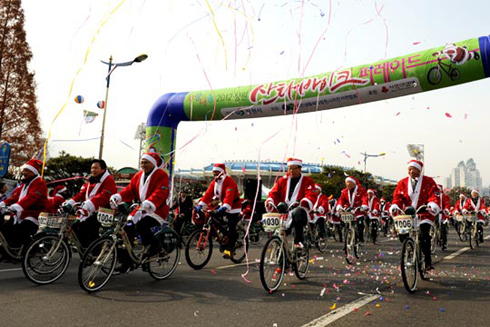 Over 2,000 people in Santa Claus costumes appeared in Changwon, known as the city of bicycles in South Gyeongsang Province, on Sunday. They took part in a cycling parade that the southern city organizes annually to raise funds for those in need. In its fourth year, the parade this year was designed to help teenage breadwinners. After an opening ceremony, the red-robed participants rode bicycles along the 9 km course throughout the city. Performers led the way, spraying artificial snow in their tracks. 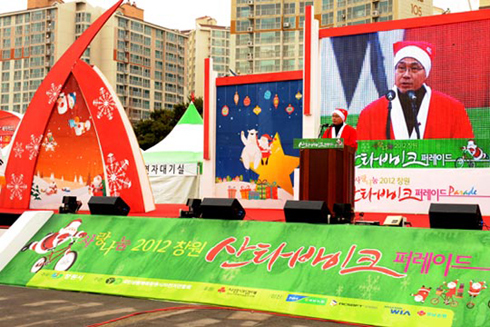 All the donations and proceeds from a charity bazaar went to the Community Chest of Korea, a charity organization. 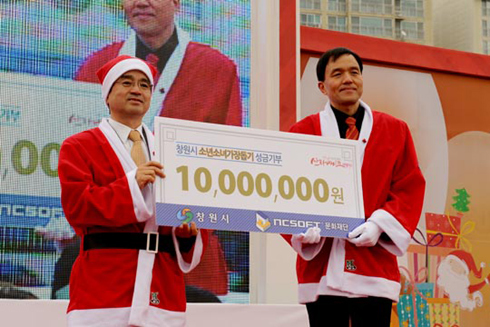 Game developer NCSoft donated W10 million to the CCK's provincial chapter and 500 bikes to the city. Hyundai Wia, a locally-based automotive parts manufacturer, delivered bicycles to 14 households who rely on adolescents as the main income earners. 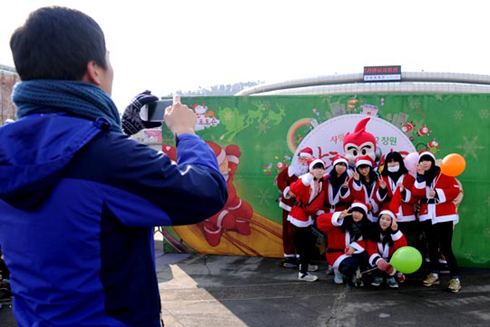 Visitors to the parade venue enjoyed various activities, such as writing down their hopes and dreams for the year ahead, taking pictures with Santa, making clay dolls and having caricatures of themselves drawn. "I hope the event serves to raise awareness of those less fortunate than ourselves," said Cho Ki-ho, the city's vice mayor, at the opening ceremony. He urged the participants to pursue more efforts to promote a society that actively helps its underprivileged communities. "As well as being for a good cause, this event aims to encourage people to ride bicycles in the winter [when Korea faces a bigger threat of power outages due to surging power demand]," said Kim Jong-oe, head of a local bicycle riders' association. "We hope the event will grow to attract more participants, not only from the city but also from around the world."